Math is very much a conceptual subject. Concepts, by nature, are very hard to work with other than in your head. For someone like me, who needs to see, touch, and experience things in order to learn them, this made math a nightmare. Fortunately, I went to a school where teachers were able to accommodate my needs. They found ways to make math a visual subject. What my fifth grade teacher called "touch points" was useful for quickly adding numbers. They way it worked was each number had a dot, or "point", on it. This dot represented the number itself, such that the number one had one dot, two had two dots, and so on. For the numbers six and higher, they had a dot with a ring around it to represent two "touches", so six had three dots with rings, seven had three dots with rings, and a single dot, eight had four dots with rings, and nine had four dots with rings, and a single dot. 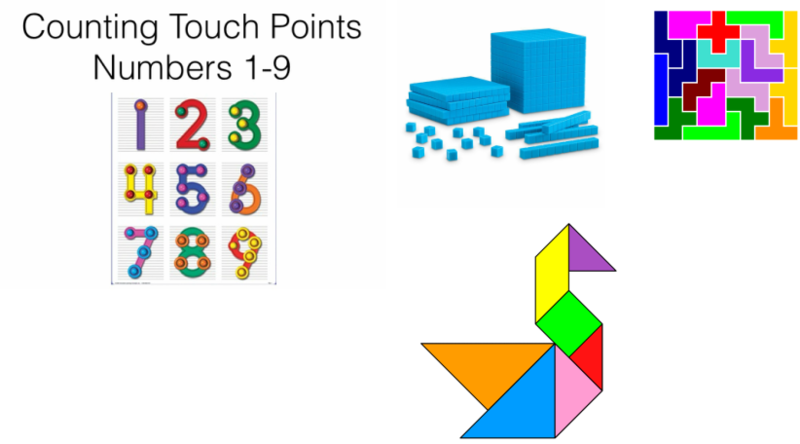 Check out this link for the Touch Math website, which I had no idea existed for so long. The site contains lots of information about their programs, success stories, and so much more. There are even Touch Math apps. ​There are, of course, other methods of making math visual. I have used various manipulatives in every math class I've had, not the least of which are blocks set in different base systems (base ten, being the base we work in, will be the most useful), tangrams, and pentominoes. These can be used in a variety of ways, such as teaching patterns, geometry, or just to make pretty pictures.